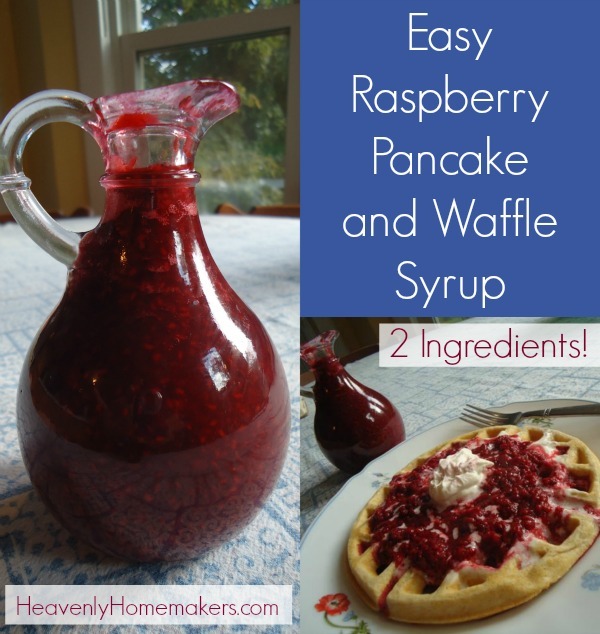 Easy Raspberry Pancake and Waffle Syrup Recipe – Two Ingredients! I just priced it. An 8.5 ounce bottle of Raspberry Syrup costs $6.99. But neener-neener, I just made some for pennies. Now granted, I got the raspberries for free – although we did pick them ourselves – and time is money, so there’s that. We got fresh air, sunshine, time with friends, and a bit of a workout while picking (swatting bugs) – so I’m going to go with priceless on this endeavor. Friends, let us not ever pay seven bucks for a tiny bottle of sugary syrup. Let us, instead, save oodles of money by making our own. Let us keep the ingredients healthy. Let us drizzle this good stuff all over our pancakes and waffles, and even top it with homemade whipped cream. Then let us rejoice together at the amazing deliciousness of this treat. Check out what I finally, finalllllly set up for you here! I seriously should have done this five years ago, but by default it fell low on my to-do list. Therefore, I skipped some housecleaning this weekend and got this done. Seeing as cleaning isn’t my fav, this to-do list swap was perfectly okay with me. Little by little I’ll switch over all my hundreds of recipes to be easy to read and print like this. You can even leave a recipe review after you give it a try! It is too fun. Hope you are enjoying fall weather, fall food, and fall um…what else? What do you love about fall? I’d have to say it’s all pretty fun except for the way fall soccer season makes our shoe closet smell absolutely terrifying. Ask me how I felt when I realized that all of the York College cheerleaders came into my living room and walked right by the open – OPEN – closet door before I realized that one of my boys had left it that way. Messy closet aside, I just hated that they had to be put through the torture of breathing in the green cloud. No one died, and we are grateful. One of my boys said that he feels it’s best to leave the closet door open so that it can air out. This is a great idea except for how that creates 3,000 square feet of stink throughout our entire house (notice the double meaning on the word feet there). SHUT THE CLOSET DOOR already. Or maybe burn the shoes. Friends, you are so sweet to hang out with me here. You all smell so good and you are so nice. 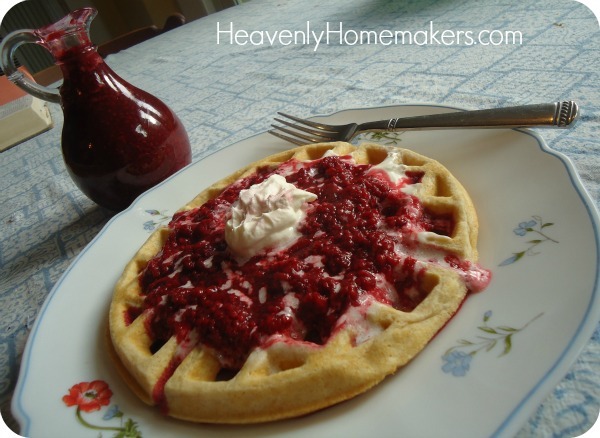 Here you came by for a Raspberry Syrup recipe and I share all the gross details of my happy life. Raspberry Syrup smells oh so sweet. It also tastes good. And look! I installed a new easy-to-use recipe reader and printer-outer. That was me, distracting you and taking you back to the good parts of this post. Love ya. I’m going to look into this to see how to make it mobile friendly! Would you be willing to check this on your phone again to see if it shows up for you now? Hopefully it’s mobile friendly now! I can’t see the recipe either! I’ll try from my computer tomorrow, but my phone is my main means of access. I show the same thing as Amy for this recipe & the first one linked. The other three linked I can read with a little “yum” button under them. Thank you for letting me know…I’m looking into this! Can you check on your phone again now to see if it shows up for you. Hopefully I fixed it! Ooh, great challenge! I’ll see what I can come up with! Yep, works for blueberries, peaches, or strawberries even! Yay! I can see it now. Thank you!